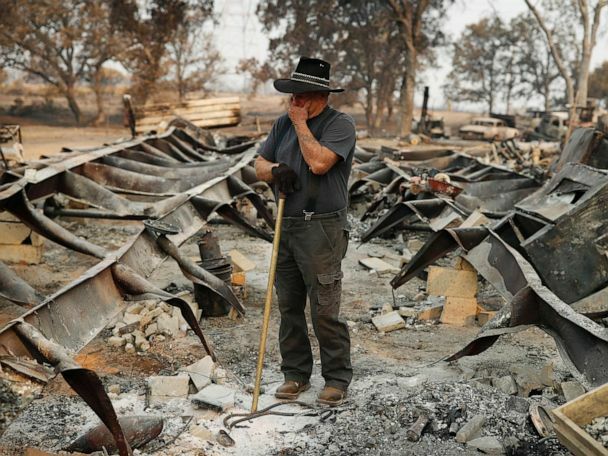 Ed Bledsoe tries to hold back tears as he searches through what remains of his home, Monday, Aug. 13, 2018, in Redding, Calif. Bledsoe's wife, Melody, great-grandson James Roberts and great-granddaughter Emily Roberts were killed at the home in the Carr Fire. A flag flies at half-staff amid the rubble of homes burned in the Carr Fire, Sunday, Aug. 12, 2018, in Redding, Calif.
Loretta Root wipes her eyes while visiting the remains of her home in the Keswick area burned in the Carr Fire, Aug. 9, 2018, in Redding, Calif. The remains of homes are viewed from the air in Redding, Calif., after wildfires ravaged the area. The Carr and Ferguson wildfires in California can be seen burning in this image taken from the International Space Station, Aug. 3, 2018, by astronaut Alexander Gerst. 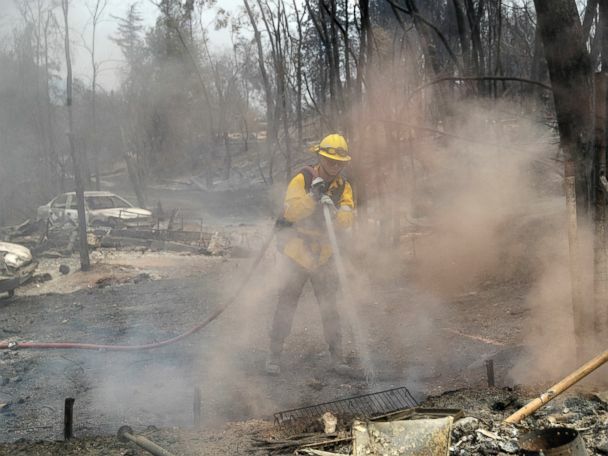 Volunteer firefighter Luke Senger stands next to a home destroyed the Holy Fire in Trabuco Canyon, Calif., Aug 6, 2018. An air tanker drops retardant on the Ranch Fire, part of the Mendocino Complex Fire, burning along High Valley Rd near Clearlake Oaks, Calif., Aug. 5, 2018. 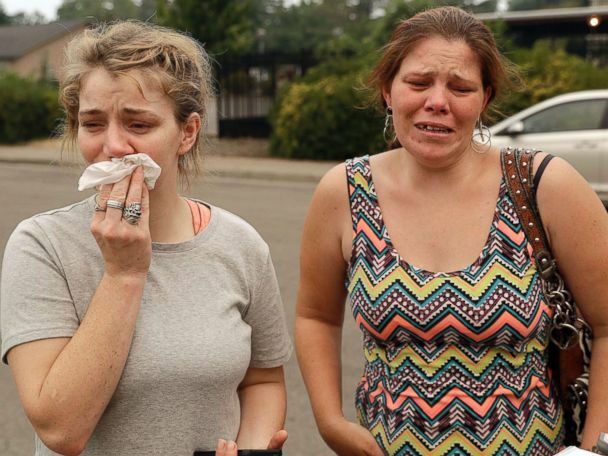 <br><br>Several thousand people have been evacuated as various fires swept across the state. A helicopter prepares to drop water on the Ranch Fire, part of the Mendocino Complex Fire, burning on High Valley Rd. near Clearlake Oaks, California, Aug. 5, 2018. Resident Lane Lawder carries a water bucket while fighting to save his home from the Ranch Fire burning down New Long Valley Rd near Clearlake Oaks, California, Aug. 4, 2018. <br><br>The Ranch Fire is part of the Mendocino Complex, which is made up of two blazes, the River Fire and the Ranch Fire. A firefighter runs while trying to save a home as a wildfire tears through Lakeport, Calif., July 31, 2018. A washer, dryer and a hot water heater are the largest remains of a home that burned during the Carr Fire on Ridge Drive in Redding, Calif., Aug. 2, 2018. Burnt antique cars lie in ruins in the Keswick neighborhood as the Carr fire continues to spreads towards the town of Douglas City near Redding, Calif., July 31, 2018. The El Dorado Hotshots battle fire near Buckhorn Summit, Calif., on Highway 299, July 30, 2018. A Forest burns in the Carr Fire on July 30, 2018, west of Redding, Calif.
San Bernardino County firefighters assess the damage to a neighborhood in the aftermath of a wildfire, July 29, 2018, in Keswick, Calif.
Boat destroyed by wildfires remain docked at the marina in Whiskeytown, Calif., July 28, 2018. Firefighter Scott Brown sprays water on a backfire while battling the Carr Fire in Redding, Calif., July 28, 2018. Homes leveled by the Carr Fire line the Lake Keswick Estates area of Redding, Calif., July 27, 2018. The remains of a home destroyed by the Carr Fire, July 27, 2018, in Redding, Calif. Firefighters discuss plans while battling the Carr Fire in Shasta, Calif., July 26, 2018. A home burns along Sunflower Road during the Carr Fire, July 27, 2018, in Redding, Calif.
A structure burns as the Carr Fire races along Highway 299 near Redding, Calif., July 26, 2018. The Carr Fire was one several uncontained wildfires raging in California.